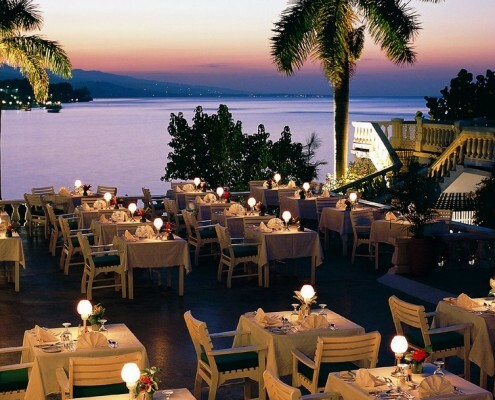 The Jamaica Inn sits along the Caribbean Sea, about 90 minutes from the Montego Bay airport. 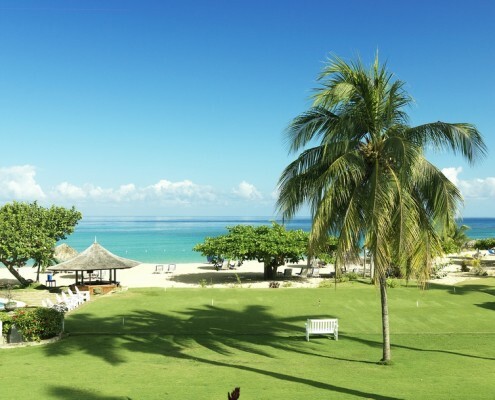 The small, intimate resort hotel, known for its thriving palms, bougainvillea and jacaranda-studded landscape, is the ideal resort for couples looking for alternating vacation days of non-stop action mixed with an assortment of minimal effort R&R options. 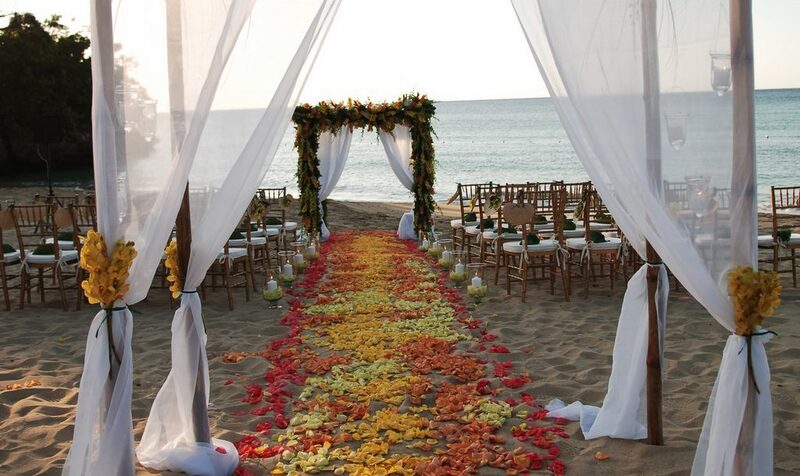 This tropical refuge is also making a name for itself as an ideal setting for small yet exceptional destination weddings. 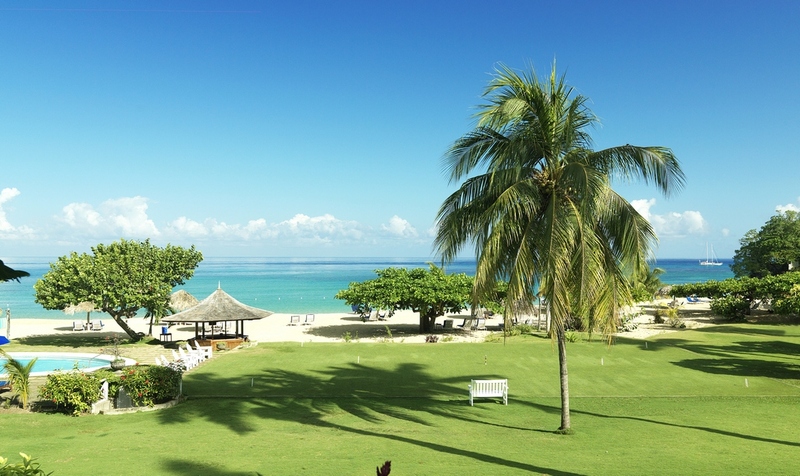 The Jamaica Inn allows children 10 years and older March 1 – December 14, and 12 years and older are welcome December 15 – February 28/29. 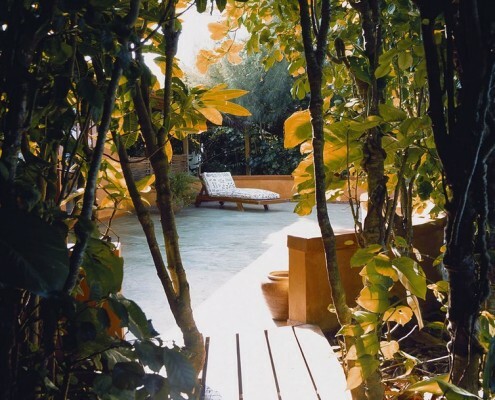 Expect the silence to soothe your mind and erase the worries from your body upon arrival. 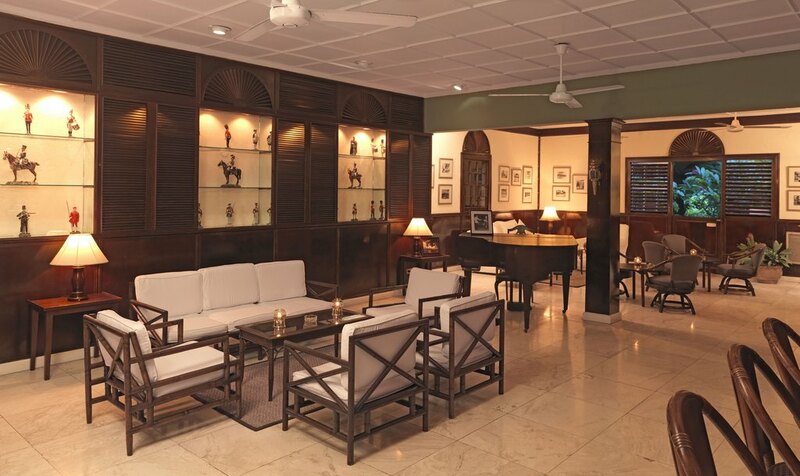 Jamaica Inn Hotel’s commitment to providing the ultimate in relaxation is the foundation for its strict, no clock, no TVs and no radios commitment. Lounge near the swimming pool, and experience the long-lasting effects of myriad organic body and facial spa treatments. Keep trim at the fitness center; catch up with work associates in the meeting room, and use the resort’s laundry services to take care of all your dirty clothes for you. Stroll slowly in the art gallery to appreciate world-class pieces without interruption. 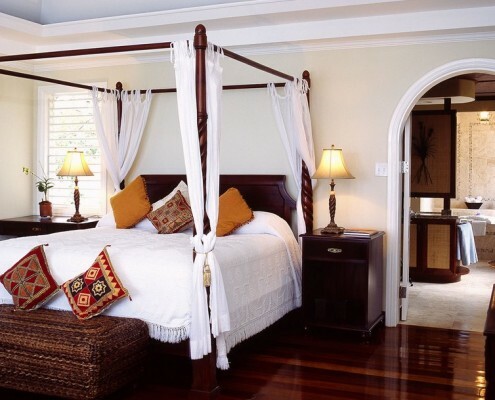 Each of the resort’s 47 suites feature varying in-room amenities, such as private, furnished verandas and balconies, one king-sized or two twin beds, and ocean views. Air conditioning and ceiling fans are also standard guest conveniences. 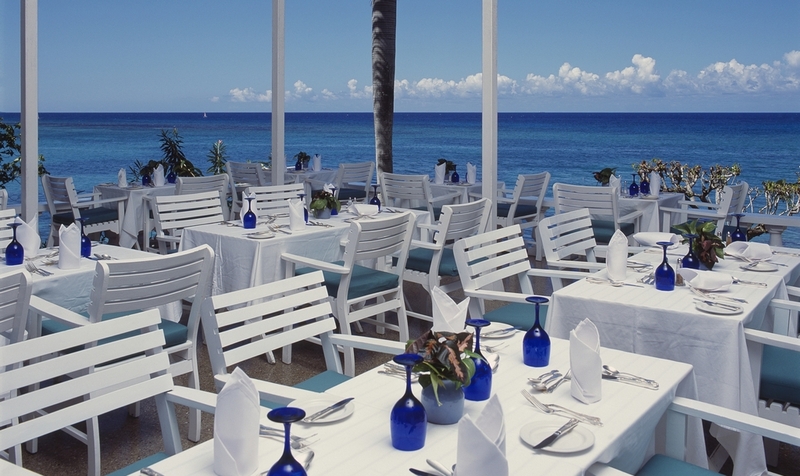 The resort’s celebrated culinary staff offers a Jamaican-continental cuisine fusion menu with highlights such as coconut-encrusted red snapper and jerk chicken served with mango salsa. Have breakfast, lunch or dinner in your room for a small fee, or opt to dine with other resort guests under the sun or stars along the beautiful terrace. Themed nights, including lobster night, will leave your taste buds longing for days end as soon as you awake. Please inquire about women’s and men’s dress codes before entering the dining area. 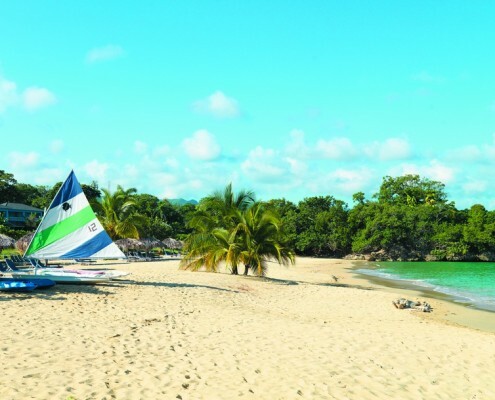 Kayaking, sunfish sailing, croqueting and snorkeling are complimentary guest activities. 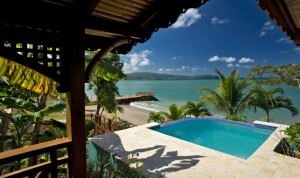 You can also engage in tennis matches, horseback riding, local eco-tours and sailing for nominal additional fees. 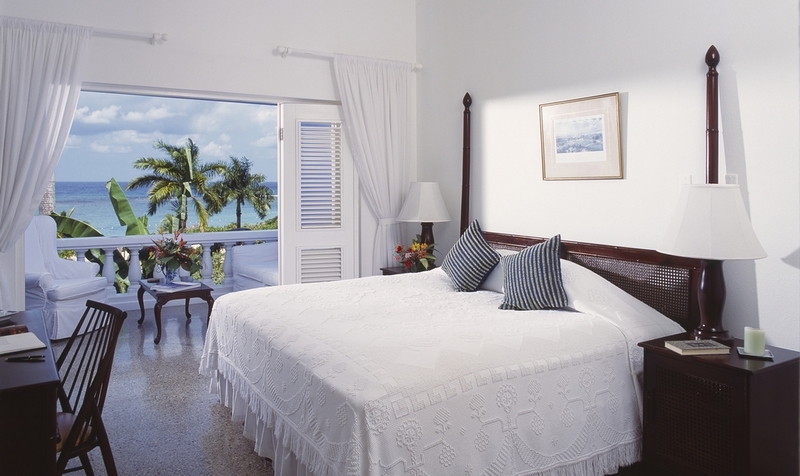 Jamaica Inn’s crowning glory is its accommodations — spacious, impeccable and very tasteful. Beds are always freshly made, even after an afternoon nap. 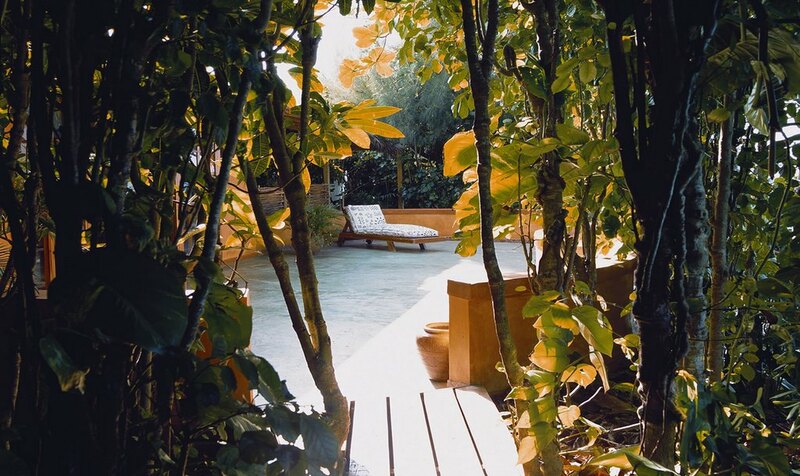 There are no TVs, Radios or Clocks to intrude between guest and rest. The cool sea breeze filters through louvered shutters. For the occasional lull, ceiling fans and air conditioning provide comfort. 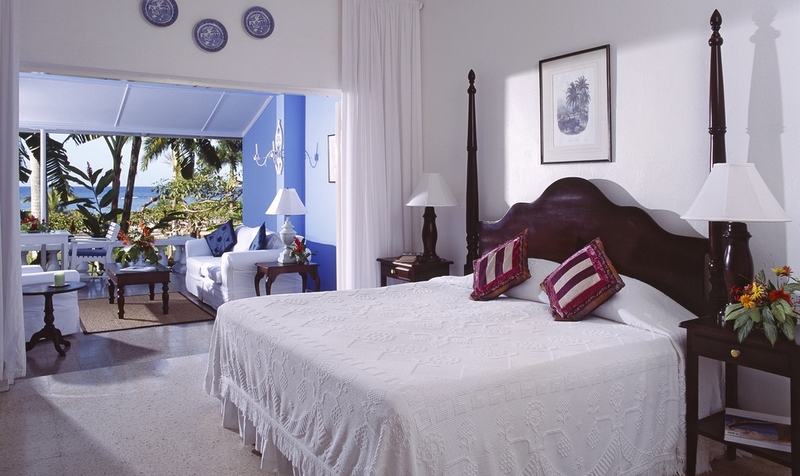 Each suite has a private balustraded balcony or large verandah overlooking the water. Balconies and verandahs come complete with a full sized sofa, wing chair, breakfast table, writing desk and coffee table. 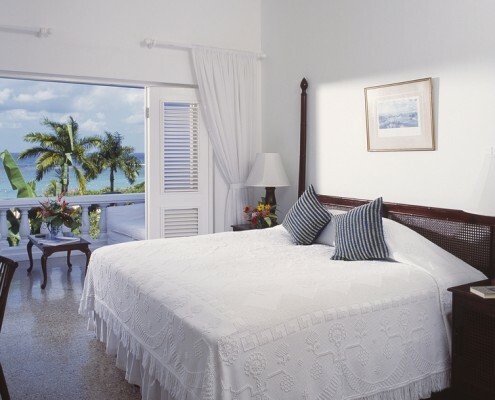 The property’s suites are equipped with air-conditioning, ceiling fans, hairdryers, mini fridges (stocked on request), robes, your choice of king or twin beds and complimentary wireless internet access. Located upstairs on the Main Wing and East Wing. 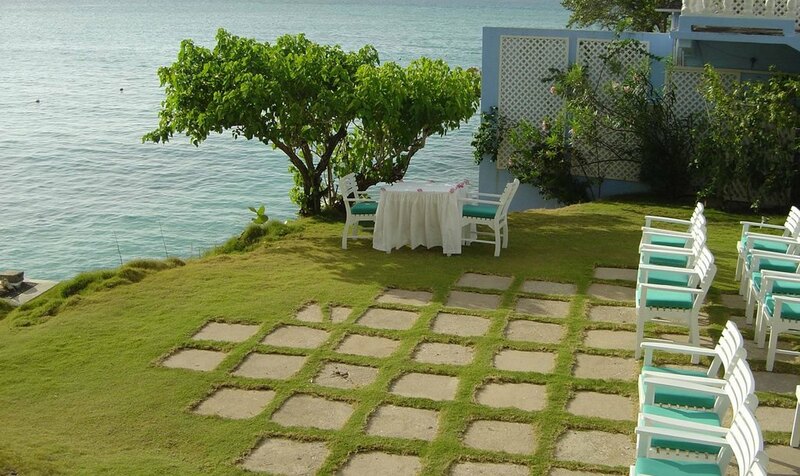 This lead-in category has a tremendous view across the lawn to the beach & Caribbean Sea as well as to the Mountains. 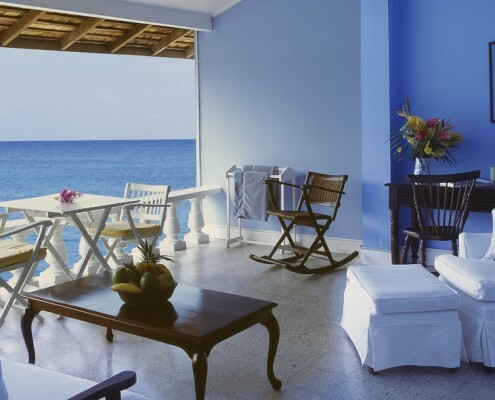 Soak in the sea breeze while sitting on your large balcony enjoying the Caribbean sunset. 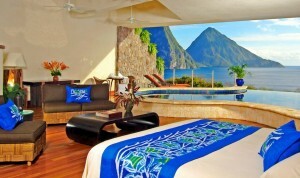 While staying in the Balcony Suite it is easy to assume that you are in the best room in the house. Located on the ground floor on the Main Wing or East Wing. 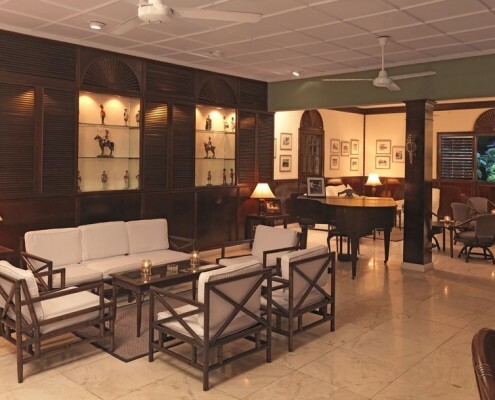 This suite has a huge verandah that is best described as a fully furnished outside living room. 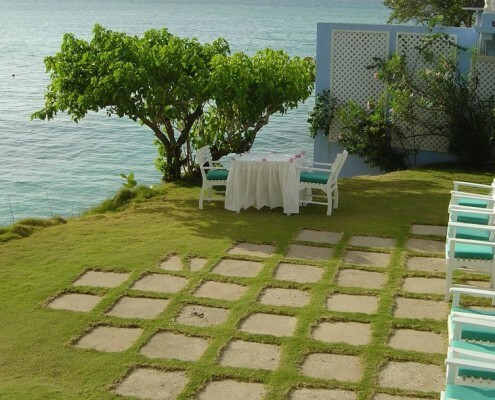 There is a great view across the lawn to beach & Caribbean Sea. 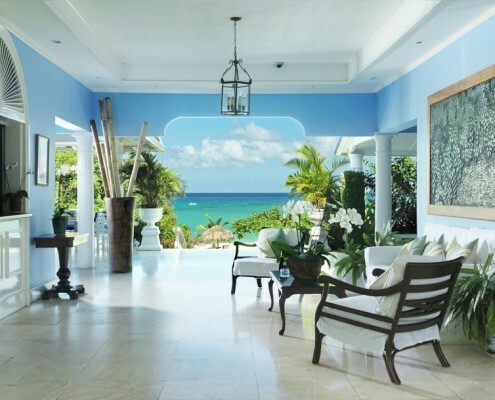 Take advantage of the ability to exit from your verandah and stroll past the croquet lawn & beach bar right onto the beach. Located on the West Wing or Beach Wing. 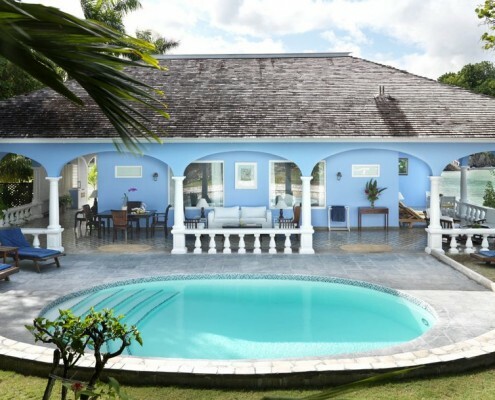 These suites have fully furnished outside living room style verandahs and are located either directly on the water (West Wing) or right on the beach (Beach Wing). 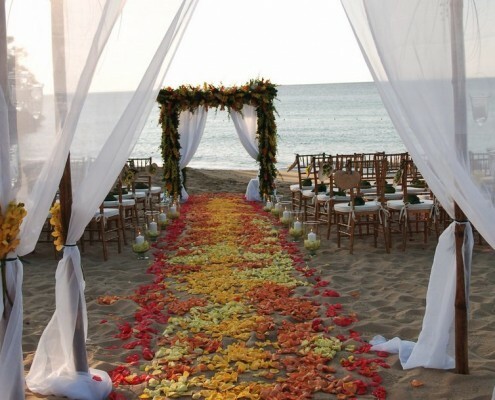 Save some bread from breakfast to feed the many beautiful tropical fishes from your West Wing Verandah or choose to be located on the Beach Wing where you simply hop over your balustrade and your toes will be in the sand. This was Lord Cowdray of Polo Fame’s favorite suite. The Cowdray Suite is located upstairs on the East Wing. 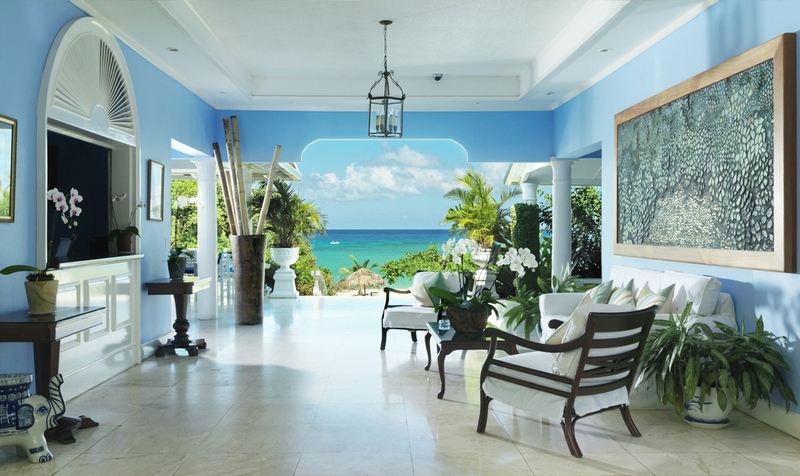 This suite gives you a phenomenal view across the property grounds over to the sea & mountains for gorgeous sunsets. The Cowdray Suite features a large bedroom with separate dressing room. Get fully relaxed while lounging on your extra large fully furnished outside verandah. 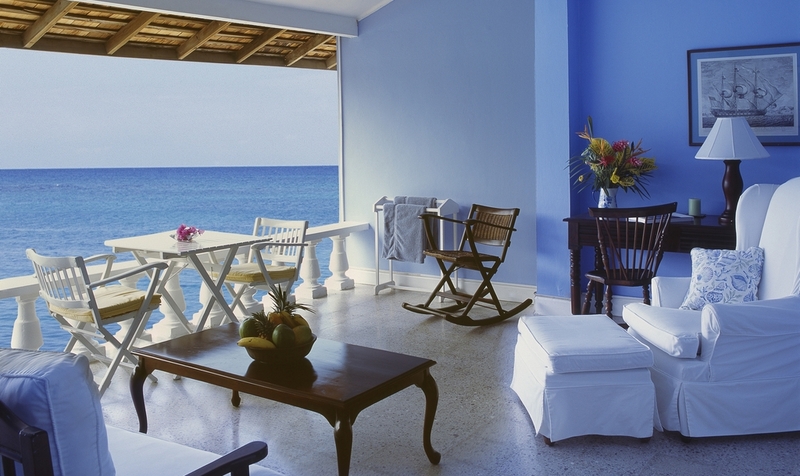 A luxurious and private one-bedroom cottage – right on the beach. 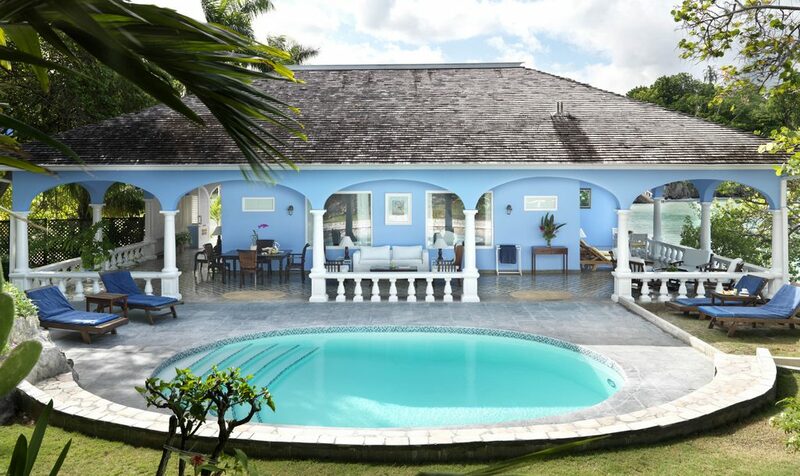 There is a fully furnished verandah where you can enjoy the view out to the beach & sea. 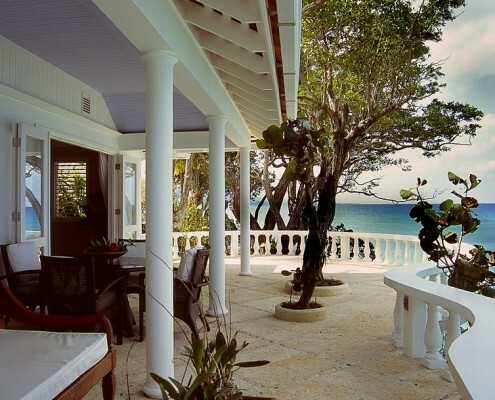 The large shuttered verandah can be opened for a dramatic ocean view or closed for total seclusion. This suite is often a favourite of many return visitors. Pick a magazine from your antique table & enjoy this exquisite hideaway. 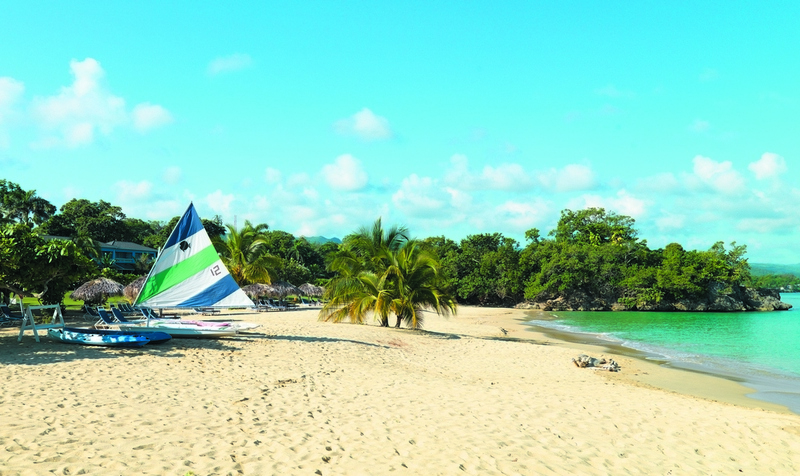 Magnificently situated on its own private peninsula. 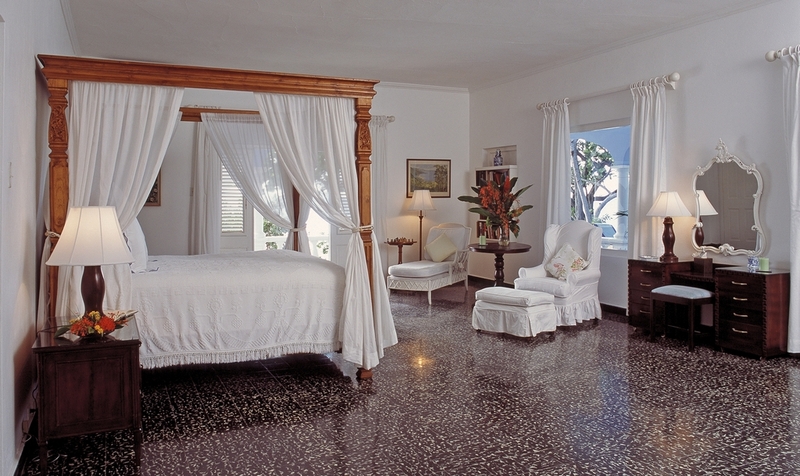 A unique suite, furnished with fine Jamaican antiques consisting of a large bedroom with sitting area and luxurious marble bathroom. 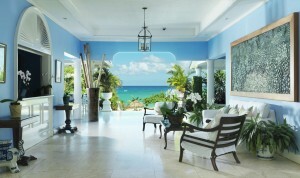 Breathtaking vistas of the Caribbean Sea can be seen from anywhere within the 2000 square feet of living space. 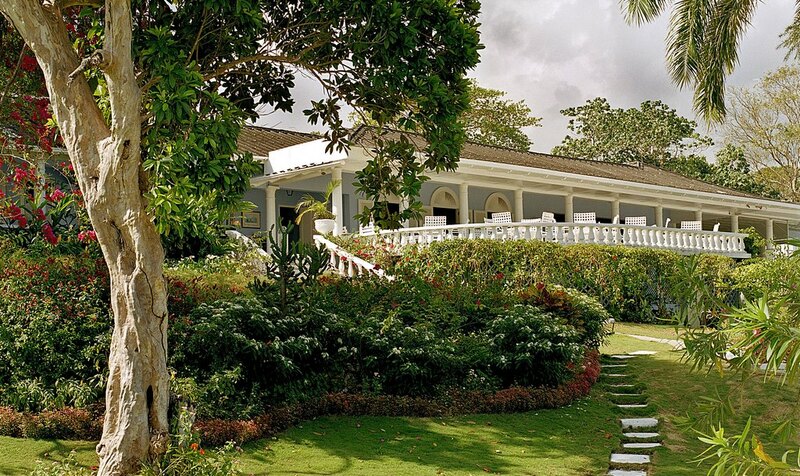 The expansive private terrace opens onto its own secluded pool surrounded by lush vegetation. 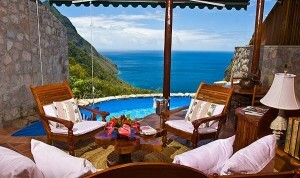 Cottage 3 & 4 are situated on a bluff that overlooks the Caribbean Sea with spectacular panoramic views. 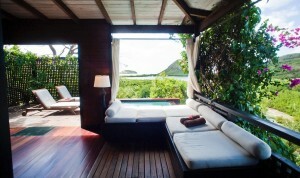 These free-standing suites are just steps away from the main hotel. Their oversized bathrooms feature separate shower and tub and marble floor. Each has an outdoor shower and an infinity pool for plunging just off the bedroom where guests can relax and enjoy the natural beauty surrounding them. Both are exclusively private with their own entrances to the sea. A wet bar is located in the living room of each of these suites. 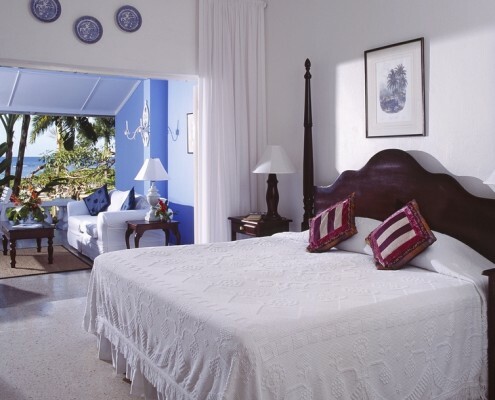 To the very east of the property stands this private one bedroom 2018 square foot two store cottage, with its own pool and access to a private cove in the Caribbean Sea. On the ground level you enter through a foyer area with a cathedral ceiling between a double volume staircase and the living room. The living room has 20 foot glass doors facing its private infinity edge pool (16’ long x 6’ wide) overhanging the Caribbean Sea. 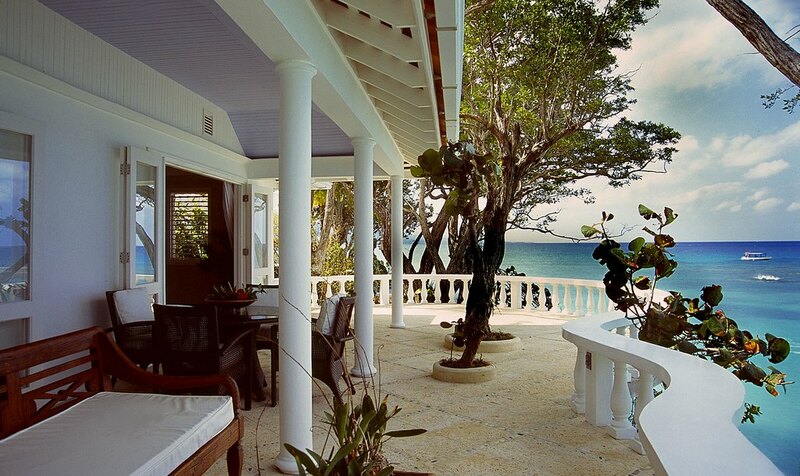 2 feet below the pool deck is a wooden deck for lounging or dining cantilevered over the sea. 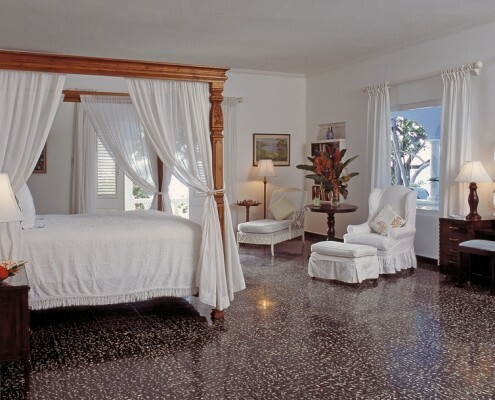 The living room is tiled with large format shell stone and furnished with contemporary Caribbean furniture. The Bar is equipped with a beautiful art sink by Jamaican potter, David Pinto and lit by a collection of pendants overhead. There is a powder room on the ground floor. The vanity is fabricated from a chunk of local Guango wood. A wooden stair case rises through double volume space to the bedroom on the second floor. Two sets of French Doors open to the amazing sea views to the north and east, with a balcony facing the cove. The floor for upstairs is teak. 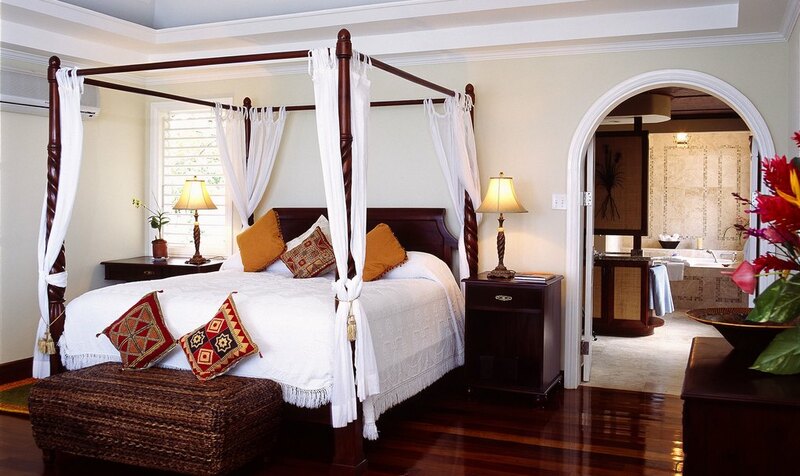 The bedroom is accented by a custom made Jamaican modern four poster bed and luxurious rugs. The bathroom boasts a free standing oval tub, two vanities, walk in closet, shower with iridescent glass tiles and just outside on the balcony is a pebble floor outdoor shower. Cocktails and Hors d’Oeuvres – Start the evening with a drink on the Cocktail Terrace while enjoying complimentary hot & cold hors d’oeuvres. After 7pm in the cocktail area a collared shirt with long trousers is required for gentlemen & ladies should dress accordingly. 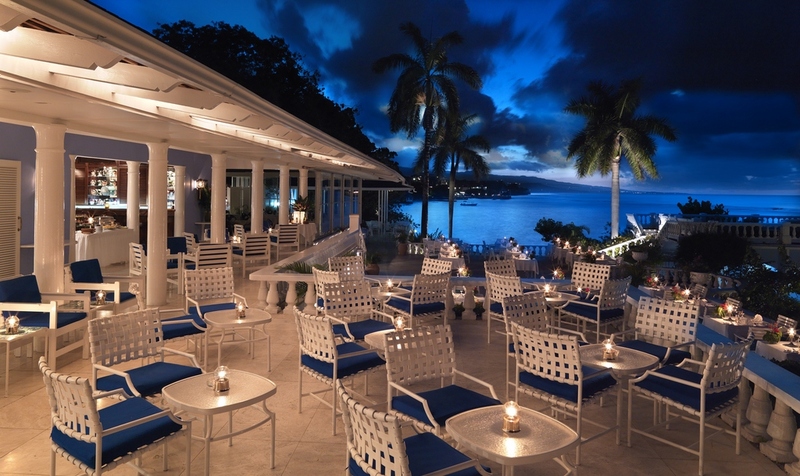 Dinner – Have a 6-Course Flavourful Gourmet Dinner under the Stars while listening to a live band (live band plays most nights). 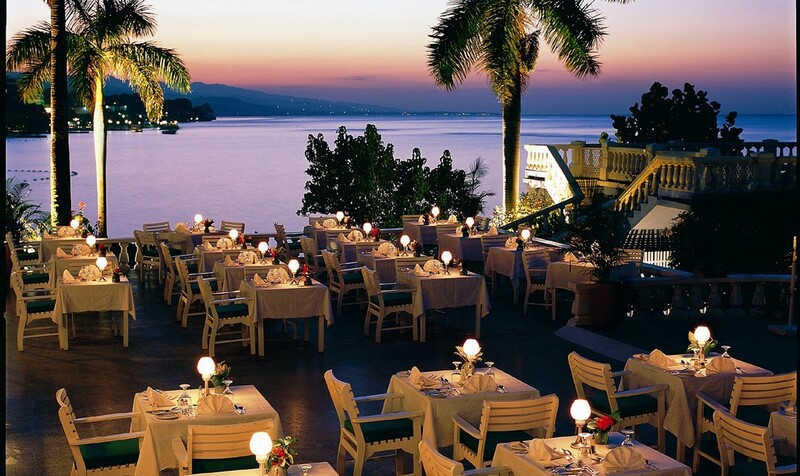 The Dinner menu at Jamaica Inn changes every night. Every Saturday night is Lobster night. (Except April 1 – June 30 when lobster is out of season). 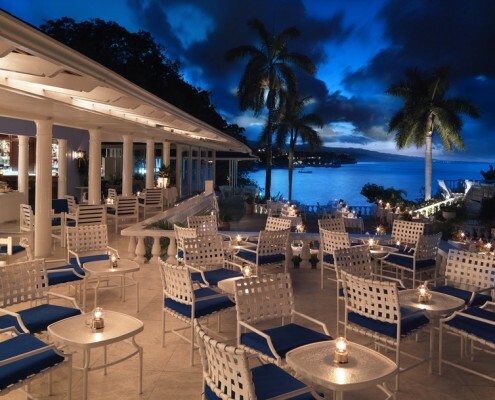 Dinner is served on the Dinner Terrace from 7:30pm – 9:30pm. For dinner, a collared shirt with long trousers is required for gentlemen & ladies should dress accordingly. 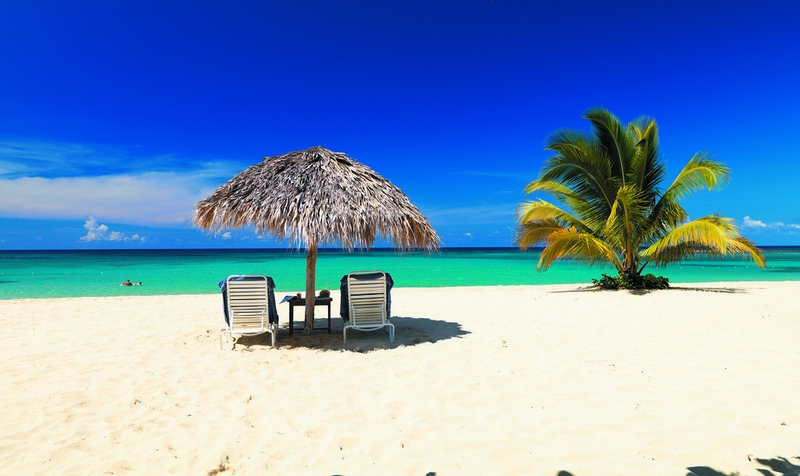 The Beach – During the day, the most popular spot at Jamaica Inn is it’s 700 foot beach that is covered with champagne colored soft sand. 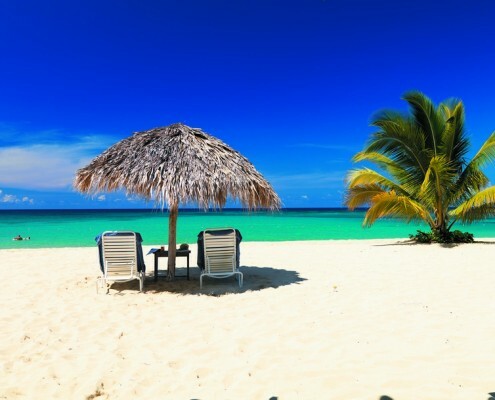 Often ranked as one of the best in the Caribbean, Jamaica Inn’s beach is one to experience. 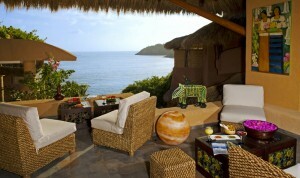 Relax in your lounge chair under your very own palapa and enjoy the serenity of this uncrowded gem. 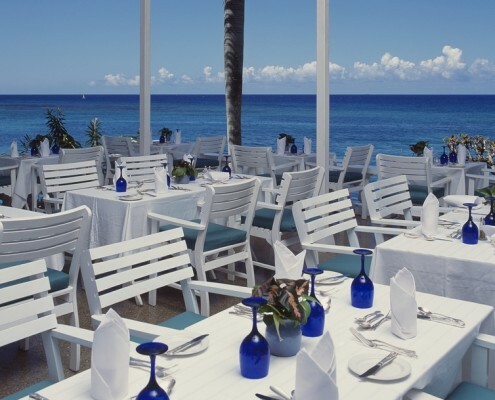 Have lunch delivered to you right there on the beach with no additional charge for delivery. Enjoy a choice of one complimentary Planters Punch or Blended Fruit Punch which is served to each guest on the beach daily (between 11:00am – 12:00pm). Our bar staff is patrolling the beach all day to ensure that nobody is thirsty. 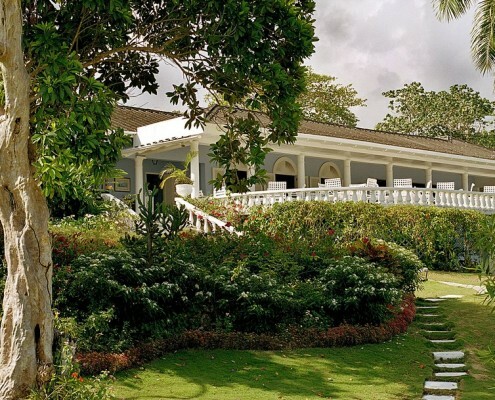 Sports – On-property croquet, swimming pool, snorkeling, kayaks and sunfish sailing are complimentary. Fitness – An exercise room is located in the garden wing. Equipment includes a stair climber, stationary bicycle, treadmill and free weights. 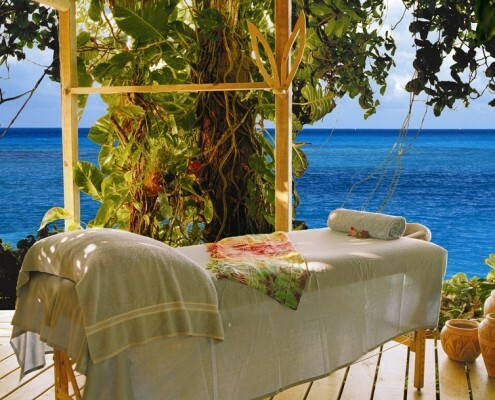 KiYara Ocean Spa – For an extraordinarily relaxing experience get pampered at the KiYara Ocean Spa that is located on the seaside cliffs at Jamaica Inn. 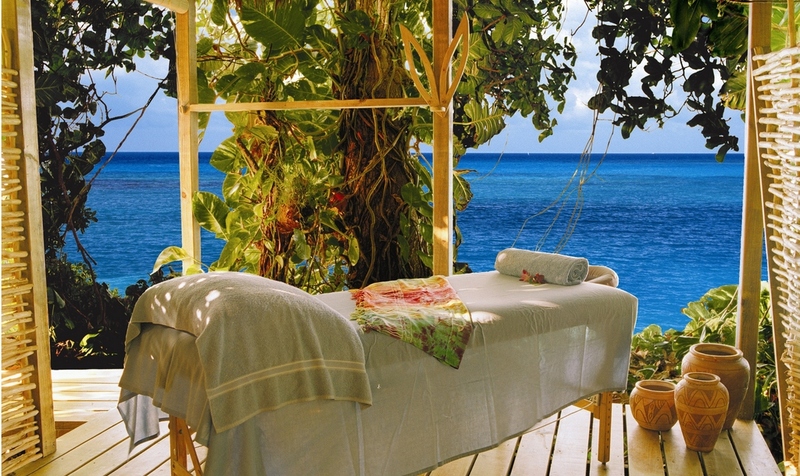 The KiYara offers a wide range of holistic & blissful treatments.